Instructions: Cut a piece of white cardstock 10" x 7", score at 5" along the long side and fold to create a base card of 5" x 7". Cut a piece of white cardstock 5" x 3" and score every on the Scorpal. Adhere to the bottom of the card. Cut a piece of pink and green stripe patterned paper 5" x 6 1/4 " and using the plain edge die from the HCD1-7119 Classic Basic Border Die, die cut the edge. Die cut the eyelet edge from the HCD1-7119 Classic Basic Border Die set out of white cardstock and adhere to the previously cut shaped edge of the paper. Adhere this to the front of the card with foam tape as shown. 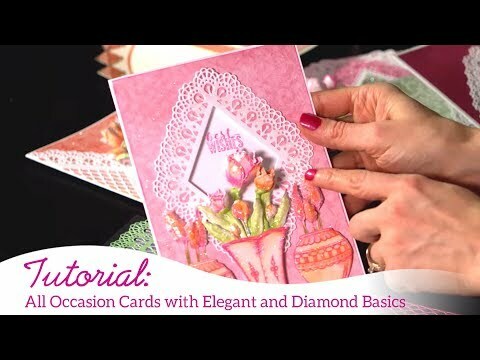 Die cut the decorative lacy diamond die from the HCD1-7228 Lacy Diamond Die out of white cardstock and add Frosting Powder to the edges and then adhere to the front of the card with foam tape. Add small clear sparkles to the die. Stamp the tulip spray image from the HCPC-3859 Tulip Bouquet Stamp set in Shadow Grey ink on Iris cardstock and colour with Zig Clean Colour Brush markers before die cutting with the coordinating die. Shape, add Crystal Clear glitter to the spray and adhere to the front of the fern and flower images. Die cut the tag using the die from the HCD1-7202 Ticket & Tags Die set, shape and adhere to the tulip spay. Make a bow from the purple ribbon and adhere it to the tulip spray as shown.